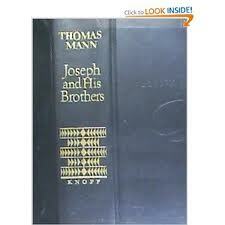 My father adored Thomas Mann’s Joseph and His Brothers and read the whole (1200 pages mind you) at least twice. I’ve always been put off because it’s one heavy book (pounds and pounds) with big long sentences, huge paragraphs and not too much dialogue. I know, I sound like one of those “reluctant readers” who have to be cajoled into reading via vampire plots or graphic novels. I have his copy, the very one pictured here. I flipped through and found one passage marked (my father wasn’t big on marking up books). It’s pretty nice. “Rest gently,” answered Joseph with feeling, “after the toil of day. May your soles, that are scorched from the heat of your path, move blissfully over the mosses of peace.” Doesn’t that make you want to go out and walk on moss? I’ll give it a try.